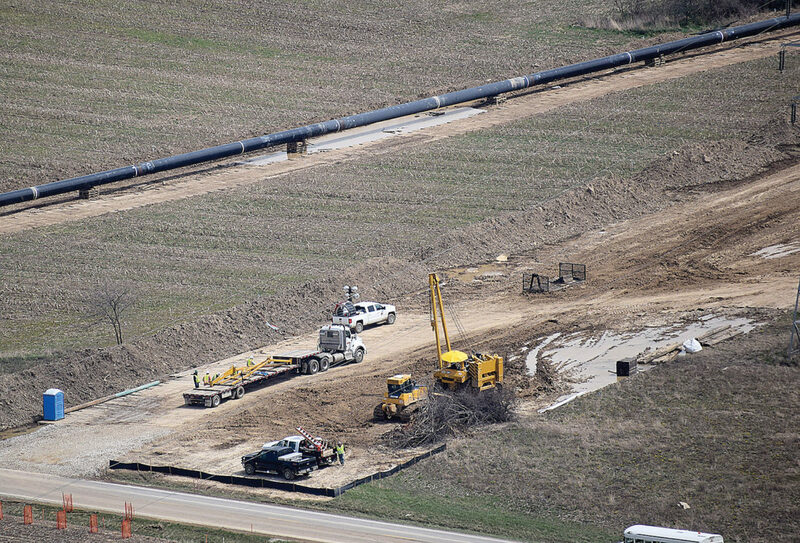 PHOTO BY JILL GOSCHE Crews work on the Rover Pipeline. The view is via a plane piloted by Tiffin Aire April 11. In western Ohio, the dominant energy technology is from utility-scale wind and solar power. In eastern Ohio, the main technology is extracting natural gas by fracking shale. In Seneca County, they come together in a unique way, said Dale Arnold, director of energy, utility and local government policy for Ohio Farm Bureau Federation. As he understands the federal government’s energy policy, Arnold said President Donald Trump means to allow new and old technology to compete equally. “Mr. Trump is a business man,” Arnold said. “He wants, I feel, a level playing field, which means this: He’s taking a look at all the different energy types. A tremendous amount of technology is happening with each one of these. As energy policy changes at the national level, Arnold said the energy industry in Ohio — and particularly in Seneca County — is in a rapid state of transition. Arnold said he’s been working with landowners in Seneca County who are dealing with negotiations on wind, solar and pipeline projects as well as electric transmission lines and oil and gas leases. He said the county’s geographical location is where east meets west. To that end, Arnold said, he’s been working with individuals, groups and local government to educate them about negotiating energy leases. “Also, a number of energy service providers who are looking at wanting to create infrastructure in Seneca County,” he said. He said his job is to explain to the landowners and government officials the company’s stance on energy matters, and to explain to the companies the needs of farmers and landowners. Arnold said landowners must make themselves familiar with energy company needs, and farmers should think of the energy companies as business partners. Arnold said current pipeline projects — such as Rover and Utopia — are only the beginning, and landowners would be wise to educate themselves and learn negotiation skills. He said some landowners tend to sit back and hope the issue is going to go away. And those companies are actively planning projects — eight of them at last count. Along with Rover and Utopia pipelines, he said there are three or four electric transmission line projects under way. In addition, he said the Republic Wind project plans are ongoing as well as two more companies evaluating the county for two wind projects. And three companies are contacting landowners about oil and gas leases. Arnold’s advice is to hire legal counsel familiar with negotiating energy leases and easements. By the time a landowner is contacted about a group information meeting, Arnold said the potential project has been in the planning stages for 18-24 months. He doesn’t think any of Trump’s policy changes are going to alter projects being considered. Arnold said Trump wants to offer tax credits and economic stimulus packages to all types of energy producers on an equal basis. “He is a business man. He understands business,” Arnold said. “But business and government are two different things. He’s trying to find and corroborate those things. “I wish him success in trying to find strategies where all of those things can be accommodated,” he said. As fossil fuels get an equal part of the level playing field, some people are concerned about global climate change and the United States meeting its commitment to reduce carbon emissions. Arnold said Trump’s policy is to review ideas that have been in place for several years. Amy Berger, professor of geology at Heidelberg University, said the uncertainty of Trump’s policies causes her concern about long-term effects of climate change. Although she isn’t a climate change scientist, Berger said she has a general knowledge of the topic as a geologist. The amount of warming may seem miniscule, but she said it’s significant. She said it’s imperative that the world prevent a 2-degree overall warming by the year 2100. “If we get beyond a 2-degree warming, it would be seriously bad because we couldn’t counteract it,” she said. To that end, Berger said world representatives met in 2015 to negotiate the Paris Accord. “It was sort of a beginning to try to avoid that threshold,” she said. “The U.S. agreed to change emission rules for power plants, increase fuel economy for cars, decrease methane leaks and improve appliance efficiency. If nothing was done about climate change, Berger said the world would be 2.7 degrees warmer by the end of this century. “Without any action we’re looking at some fairly substantial changes,” she said. The effects already are being seen with longer summer seasons with more extremely hot days. She said warmer temperatures put more stress on growing crops, and warmer winters mean more pests survive through the winter. She said changes also have been seen in the intensity of rain storms. Berger said the United States is the second-largest producer of greenhouse gases, behind China. That’s where policy uncertainty becomes an issue. Trump’s policies to change emission regulations for coal-fired plants could be detrimental along with lifting a moratorium on extracting coal from federal land. “It feels a little bit like the first volley in his policies to dismantle the climate policies,” she said. “As a geologist, I sort of think long term, but as a citizen we’re trained to think short term,” she said. Politicians must run short term to retain their positions, which can be detrimental to thinking long term. “We have to be incredibly far sighted,” she said. “We’re trying to correct something that most of us won’t see the worst of. It draws on our sense of moral obligation to the future. “We’re not politically, morally or economically set up that way,” she said. While large companies often have a future plan in mind, individuals don’t. Berger re-told a folk story. She said she doesn’t know how factual it is, but it illustrates the point she wants to make.